Posted on September 20, 2014 October 11, 2017 by TammiePainter in Books, Books, Books! Wow! Seriously, that sums up anything I could offer as a review for The Song of Achilles by Madeline Miller. But since reviews tend to be a bit more long-winded than a single word, let me continue on with this week’s Saturday Selection. At its most basic, The Song of Achilles is a re-telling of the story of Achilles from his youth and on through his role in the Trojan War. But the book is much more than just a rehashing of a story we’ve seen numerous times. Instead of the focus on war, the focus of the novel is a love story (yet not in a cheesy romance novel kind of way). 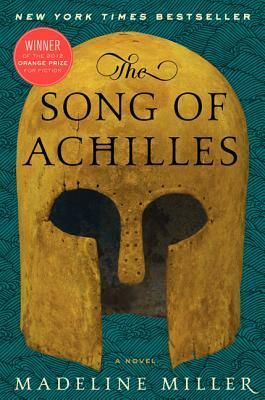 The story is told through the eyes of Patroclus – a prince who just can’t seem to please his father and who ends up exiled to the home of Achilles’s father. Patroclus is bitter because Achilles, being the son of a goddess, is everything he will never be, but the boys strike up a friendship that eventually turns to an intense and dedicated love for each other. Added in to the emotional struggles the men face and the physical challenges of being part of an invading army, is Achilles’s mother’s disapproval of Patroclus – believe me, she is the mother-in-law from hell, or, well, Hades in this case. Everything plays out against the backdrop of the legends of the Trojan War. If you’re not familiar with the myths, this is a good way to learn about them (although it’s not going to replace actually reading Homer’s Iliad for literature class). Wow! Oh, wait, I said that already. Besides wow, my overall feeling after reading (okay, listening to) The Song of Achilles was, “Holy crap, I’m glad I’m not writing a book based on Achilles because this would be hard to beat.” (Achilles will play a role in my series, but he’s not the star of the show). I also felt a twinge of writing jealousy – Miller’s lovely writing is definitely something to aspire to. As I said, the book retells the legends of Achilles, mostly based around the stories in The Iliad. If you do know the myth, The Song of Achilles in no way feels dull or predictable. Yes, you do know the fates of both Patroclus and Achilles, but Miller plays it out in a way that feels fresh and like the story is being told for the first time. Although I found this to be one of those I-can’t-put-it-down-please-don’t-let-it-end books, The Song of Achilles can be very slow in some places, but Miller’s skill with detailing emotions, describing settings and building the tension between the characters is handled so beautifully and passionately I never felt bored – which is rare for me because I generally prefer fast-paced stories, rather than wordy, emotion-filled stories. Yes, this book is about homosexual love. If that offends you or disgusts you in any way, you may want to steer clear of this. Or maybe you should give it a chance and see the universality of emotions. Anyone who has had a crush on someone “out of their league” will feel Patroclus’s yearning for Achilles, and will also recognize the wonder (and doubt) he experiences when Achilles starts to single him out. If mythology-based fantasy is up your alley, you may want to take a peek at my upcoming novel, The Trials of Hercules.